Selected Science News: CARBON-RICH PLANET: A GIRL'S BEST FRIEND? A peculiar gas-giant planet orbiting a sun-like star 1200 light-years away is the first carbon-rich world ever observed. The implications are big for planetary chemistry, because without much oxygen, common rocks throughout the planet would be made of pure carbon, in forms such as diamonds or graphite. "On most planets, oxygen is abundant. It makes rocks such as quartz and gases such as carbon dioxide," said University of Central Florida professor Joseph Harrington, one of the study's lead researchers. "With more carbon than oxygen, you would get rocks of pure carbon, such as diamond or graphite, and lots of methane gas." "This planet tells us that there are many other strange worlds out there, beyond even the imaginations of the people doing the science," added Nikku Madhusudhan of the Massachusetts Institute of Technology. He is the lead author of the study, which appears in the Dec. 9 issue of the journal Nature. Harrington and his team at UCF led the Spitzer observations and data analysis. The UCF team used NASA's Spitzer Space Telescope to measure the light of the planet, WASP-12b, as it passed behind its star, a so-called secondary eclipse. Madhusudhan performed the chemical analysis of data from NASA's Spitzer Space Telescope. By using UCF's data and other published results at different infrared wavelengths, he compared the infrared behavior of common gases to determine the composition of the planet's atmosphere. Researchers were surprised to find methane, a trace gas on Earth, because it typically does not exist in the searing-hot temperatures found on this planet. Carbon is a key building block of life, but could life exist if there is too much carbon? NASA's recent announcement of a bacterium that thrives in a poisonous arsenic environment is yet another example of life's incredible adaptability. "I wouldn't discount any cool planet as a possible haven for life, no matter what its chemistry," Harrington said. 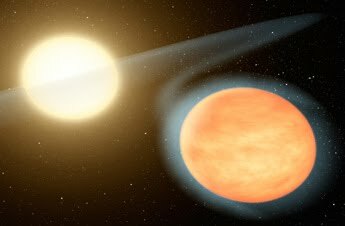 WASP-12b isn't cool enough for life. It is so close to its star that its "year" is just 26 hours, and its daytime temperatures of about 4700 degrees Fahrenheit make it the second-hottest planet ever measured. It is also the second-largest known planet, as it is more than 80 percent wider than Jupiter. The planet was discovered last year by a UK consortium, the Wide Angle Search for Planets. Some of the Spitzer data used by the UCF team were contributed by WASP team member Peter Wheatley of the University of Warwick.